Huawei introduced the Nova series at the IFA in 2016, and now its successor is heading to stores shortly before the 2017 trade show - but it bears little resemblance to the first Nova. The Huawei Nova 2's new features: dual camera, a completely modern design, and the highlight—a 20-megapixel selfie cam—secure its place at the top of the mid-range smartphone market. We took the time to review it and here's what we think. The Huawei Nova 2 launched at $365 and is now available at numerous retailers in various colors including Graphite Black, Prestige Gold and Aurora Blue. “That really looks like an iPhone!” - I’m sick and tired of hearing this phrase, especially since it’s not even true most of the time. But when it comes to the Huawei Nova 2, you can’t help but say: Yes, it really does look a bit more like an iPhone than many other smartphones. It’s not that it’s an awful thing in general, because the iPhone is very sleek and very well crafted too. It’s just not very original. Measuring 5 inches across the screen, the Huawei Nova 2 is among the most compact smartphones, and it is also only 6.9 millimeters thick and weighs 143 grams. The antenna strips are well hidden on the top and bottom of the back half. The texture on the power button could be a bit more prominent, since you can hardly feel it. On the other hand, Huawei didn’t give much love to the dual camera; both lenses significantly protrude and are quite sharp-edged. Even the edge of the fingerprint sensor could have been made finer. The Huawei Nova 2's back is matt-colored and has a sleek look. On the one hand, the surface is highly susceptible to fingerprints, like on the Huawei P10; on the other hand, it’s not too resilient either. Our Nova 2 review device has already suffered a significant flaw after two weeks; the silver aluminum was peeling. 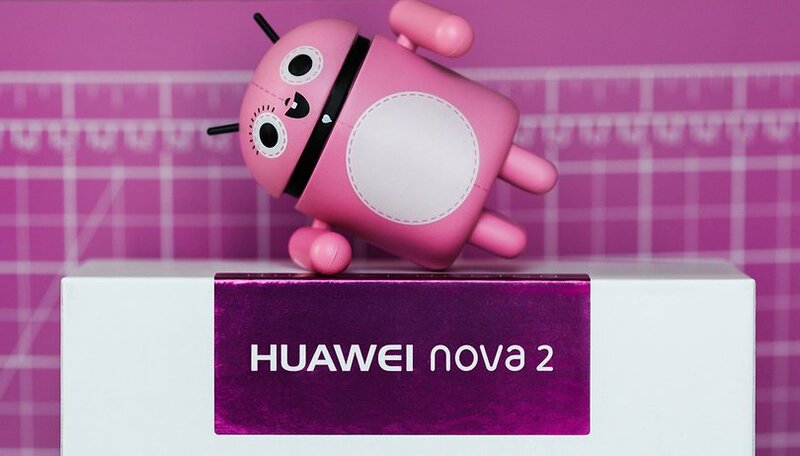 Thus, a case is recommended, which has the additional advantage of making the Nova 2 more pleasantly flat and compact. The wide edges above and below the screen look a bit old-fashioned and do not quite match the rest of the phone. The Huawei Nova 2 has a 5-inch LTPS display with full HD resolution. At this size, it is fully sufficient and provides a ppi value of 443 on paper and very vivid images in day-to-day use. Its color reproduction is pleasing and natural-looking. Viewing angle stability is good, but it’s not as good as higher-end luxury smartphones, and the display becomes a bit darker when viewed from the side. What a shame: Instead of using the ample space below the display for the Android buttons, Huawei uses on-screen control, which takes up additional space on this small display. Among the Huawei Nova 2’s features are the fingerprint sensor, nowadays standard equipment in this price range. But the folks at Huawei apparently don’t have much of a clue about what to do with this component. The scanner used to be located on the rear, the P10 saw it move a bit forwards, and it also remained there in all smartphones with screens smaller than 5.5 inches. However, this idea was scrapped a short while later with the P10 Lite, but now the Nova 2 wants to bring it back. It’s funny how Huawei simply doesn’t find and follow a consistent approach with this. The sensor itself works great on the Nova 2, but this is something that you now expect from Huawei. However, the sensor here is not slightly embedded in the housing, but rather flatly mounted. Combined with the hardly tangible ring around it, you can’t feel it very well with your finger. Huawei can do better than this. Huawei delivers the Nova 2 with Android 7.0 Nougat with its proprietary EMUI 5.1 on top. Its appearance can not only be adjusted with pre-made themes but also at a very detailed level. In its default setting, the EMUI on the Nova 2 looks somewhat cheerful and not really modern, but this depends on your personal taste. I have to praise Huawei for only installing a total of three third-party apps: Facebook, Instagram, and Booking.com, all of which can be uninstalled. Among EMUI’s features are the system search available from everywhere with a downward swipe and the lack of an app drawer, which can now also be shown if you want to. The Huawei Nova 2 sports a Kirin 659 by Hisilicon. The octa-core processor has four quick and four slow Cortex A53 cores with a maximum clock speed of 2.36 GHz. At 4 GB RAM and 64 GB of internal storage, its memory is more than enough in this price range. Apps booted quickly in the review, and the Huawei Nova 2 even handles elaborate websites and graphically sophisticated games. Some truly demanding 3D games bring the smartphone to its knees, but it’s simply not intended for that. A user will hardly have any problems with the Nova 2’s performance in normal everyday use. The bottom of the Nova 2 is equipped with an average quality mono speaker. This also applies to the headset with the plastic headphones, which is better than no headphones, but not by much. The Nova 2 has a dual camera on the rear, while the Nova 2’s front camera has two lenses with a 12 and 8-megapixel sensor with an f/1.9 aperture. Both are color sensors, and there is no monochrome sensor like the Leica cameras in the P and Mate series. Nevertheless, the Nova 2 takes very respectable photos that can furthermore be embellished with a Bokeh effect. Portrait shots have their own distinct mode, and photos have lively colors and fine detail. There is no 4K support for videos, but there is slow motion and time lapse. You can find additional full-resolution images here. The Huawei Nova 2 has a sealed battery with a capacity of 2,950 mAh, and it was easily enough to get the smartphone through the day during the review, even with heavy use. If you watch videos at full brightness for a long time, you will have to look for a power outlet after a good six hours, which is a respectable figure. Huawei’s included quick-charge charger provides 2 amps and tops up the battery in roughly one-and-a-half hours, but no wireless charging is available. The Huawei Nova 2 is a well-made mid-range smartphone that can stand out from the crowd with its cameras. Although its performance is not at the level of a high-end smartphone, that’s not something you can necessarily expect for under $400, either. This price nets the buyer a decent complete package that’s pleasantly compact with a well-made casing.